Unwrap Your Share of bgo Bingo's £5 Million! Lord Bingo News Bingo Promotions Unwrap Your Share of bgo’s £5M! Unwrap Your Share of bgo’s £5M! One of the highlights of this time of the year after all the endless shopping trips, is finally unwrapping all your gifts under the tree! Thankfully you won't have to wait until Christmas Day to unwrap your share of bgo Bingo's £5M, as well as gifts from the Boss's Christmas Workshop, and the £100k Christmas Giveaway! 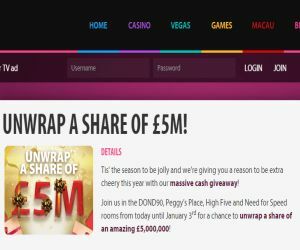 Unwrap your share of £5M! In the spirit of festive cheer, bgo Bingo is giving you even more reasons to beam from ear to ear, with the chance to unwrap your share of £5,000,000! Just make sure you don't miss the Peggy's Place £50k guranteed, Need for Speed £20k guranteed, DOND90£40k guranteed, High Five £25k guranteed bumper jackpot specials! The jackpots will be help from today until January 3rd 2016, so make sure you check the full schedule to unwrap your guaranteed jackpot rewards! While your busy playing, celebrating and shopping this month, the Boss's Christmas elves have been tirelessly working away in their workshops to create special daily offers, prizes, and cash bundles especially for you! So make sure you fill your stockings with festive delights by heading to the Fairy Delight room every day from 9.30pm to win daily free spins, bonuses and cashback offers! The workshop is open until 24th December, so you better get a move on! In case you're still looking for some extra reasons to smile and even more cash to fill your festive stockings, you can also get in on the £100k Christmas Giveaway action! You could be one of the lucky players you scoop your share of the cash prize and a spectacular £50,000, all for yourself! Make sure you check the bgo site for the full schedule to help you beat the boss and unwrap your share of festive prizes!